Alcedo . . . had two new craters when visited by Jonathan R. Green during 16-18 February 1994. According to him and Jim Stimac, who saw the craters in February 1995, the craters were located on the S wall of the caldera. At the same two points, Geist and others (1994) had previously mapped sulfur veneer and fumaroles in 1991. The points lie ~1.4 km W of El Geyser, a fumarole that lies within a similar crater and sits farther E along a common fault. . . . Geist confirmed that there were no craters in this vicinity when he made his map, and in addition Green clearly reported that these two craters were new. Besides the opening of these new craters, Green (1994) described Alcedo activity during November-December 1993, and January 1994. This included local tremor, explosions, noises from one or more subterranean sources, and increased fumarolic activity. The larger crater was associated with adjacent deposits of ash, debris, and mud. The craters were also observed during a July 1994 helicopter flyover. A videotape made during the flyover (archived at Galápagos National Park Headquarters) documented vigorous steam plumes coming from both craters, similar to plumes seen by Green in February 1994. 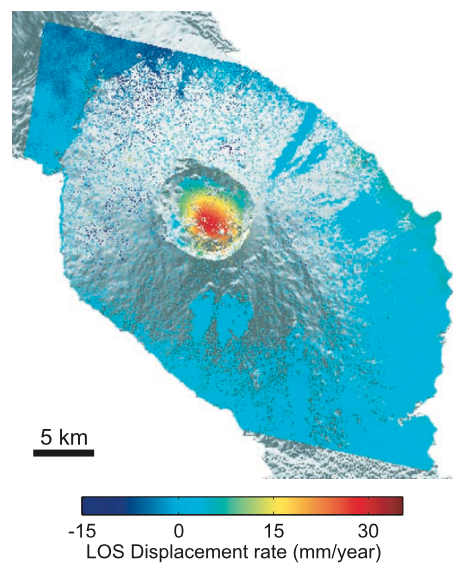 Green, who showed the craters on a sketch in his report, estimated that the larger crater was 75 x 100 m.
Although groups do occasionally visit, Alcedo is uninhabited and no one witnessed the eruption. Green's report stated: "Additional information from other guides places this activity later than mid-November 1993 and prior to the end of December 1993." Later observations were made when J. Stimac and Fraser Goff sampled fumaroles . . . from 5 to 10 February 1995. At that time the larger new crater issued a vigorous steam plume from a small vent along one side; the smaller crater issued less steam. Stimac estimated that the elliptical larger crater had a diameter of 100-150 m, and a depth of 35-40 m. The smaller crater had a diameter of 10 m and a depth of 3 m.
Layered tephra, up to perhaps 2-m thick, lies at the crater margins and extends for several hundred meters, Stimac reported. Based on the observed deposits, and on crater morphology and location, visiting volcanologists concluded the craters were formed by hydrothermal explosions. Geist and others (1994) point out that Alcedo is distinct from other Galápagos volcanoes (and many oceanic islands) in that it has erupted rhyolite and not just basalt as seen on all the adjacent islands. References. Geist, D., Howard, K., Jellinek, A. M., and Rayder, S., 1994, The volcanic history of Volcán Alcedo, Galápagos Archipelago: A case study of rhyolitic oceanic volcanism: Bulletin of Volcanology, v. 56, no. 4, Springer-Verlag, p. 243-260. Green, J., 1994, Recent activity in Alcedo volcano, Isabela Island: Noticias de Galápagos, no. 54 (H. Snell, editor): The Charles Darwin Foundation for the Galápagos Islands (100 N. Washington St., Suite 311, Falls Church, VA 22046 USA), p. 11-13. Information Contacts: J. Green, Quito; D. Geist, University of Idaho; J. Stimac and F. Goff, LANL, Los Alamos. The Global Volcanism Program has no Weekly Reports available for Alcedo. The following is from Forest Nelson. The research vessel "Alpha Hellix" of Scripps Institution in La Jolla, heading south from James Bay to Santa Cruz, sighted quite a bit of smoke emanating near the rim, either inside or outside the rim, of the south wall of the crater Alcedo which is the third volcano from the north--really the third volcano on Isabella--the one with the geyser inside the crater and lots of tortoises around the rim and also in the interior. This is the first time I have heard of or known of any activity in the Alcedo area. At night they were not able to see if there was any flame or glow because of heavy cloud cover over the area. There was no activity on the siesmograph at the station here. The following report was radioed to Scripps by Captain Haines of the "Alpha Hellix." "At noon on 26 October several persons aboard "Alpha Hellix" sighted what could have been volcanic activity from a crater at Lat 0° 25.5 south Long. 91° 06.5 west on Isla Isabella. Activity was in the form of conspicuous, but not spectacular, smoke. It had a bluish tint. The phenomenon was visible during the daylight hours on the 26th, but could not be observed on the 27th due to cloud cover. The ship departed the Galapagos on the 28th." "Initial inspections of the National Oceanic and Atmospheric Administration (NOAA) world-wide networks show no evidence of seismicity or infrasonic disturbances in the Galapagos around the time of the reported activity in Alcedo. ITOS satellite photos show no sign of a volcanic cloud despite generally clear conditions during this period. "Under good conditions, normal vapor emission from the Alcedo geyser area has been seen from 40 km away, but the description given by the "Alpha Hellix" suggests above-normal activity." The following report was received by radio from Craig MacFarland on 17 November 1970. "The activity is not a volcanic eruption but a large fire of unknown cause. I checked the area carefully, and the fire is still burning. We couldn't go down into it because it was on the inside wall and was simply too steep to even attempt to go down. The ashes from the fire were very deep and it was just plain dangerous. From surveying the fire from above and from many places on the rim far away, we couldn't see anything that looked like fumarole activity or lava or anything of that sort in that area. The location appears to be on the southeast wall of the caldera. As far as I could tell the wildlife population was not affected. "The burned area was relatively large but small in relation to the whole rim, and occurred only on the inside wall of the rim to about one-half way to the floor. The longest side of it was actually on the rim and I would estimate that it went for 500-600 m along the rim and from there coming in a triangle from the southern and the northern side going toward the floor. I checked the ash only on the rim and it varied from a few centimeters deep to roughly two feet deep in the deepest place. "The fire destroyed all the vegetation which consisted mostly of shrubs and herbs. The shrubs were a maximum height of 6-7 feet and there was an occasional taller tree. In some areas within the main body of the fire and on the edges, it actually burned everything including the undergrowth. "In terms of animals that wouldn't be able to get away from the fire quickly, I immediately thought of the tortoises. Their tracks came right up the side of the wall right through the ash and onto the rim where the burning had stopped. I surveyed the area with field glasses from various places and could see no tortoise carcasses. I couldn't see that any other animals were harmed by the fire. I suspect most birds left the area immediately; also the burros. The whole volcano has the largest population of tortoises on the island (estimated to be 3-6 thousand tortoises). The particular area on the rim where the fire started and including all the burned area, was the area of densest tortoise population. At any given time there might be 50-60 tortoises in the total burned area and apparently they had been able to get away before it burned. Their tracks occurred along the crater rim up to where the fire had occurred and on the fifth night of the fire below the rim on the inner wall we could see animals, so they had clearly gotten away from it. "We were up in the caldera for 4 days. We went up November 11 and came down November 15th. It was burning during the entire time. Occasionally a little smoke would come up above the rim. The day we came down to the beach we continued to see smoke. I suspect that itis still burning." Card 1038 (02 November 1970) Forest Nelson, Santa Cruz, Galapagos Islands, Ecuador; Carl Hubbs, Scripps Institute of Oceanography, La Jolla, California, USA. Card 1045 (10 November 1970) NOAA; T. Simkin, SI. Card 1051-1052 (17 November 1970) Craig MacFarland, Academy Bay, Galapagos Islands, Ecuador; Darwin Biological Research Station, Galapagos Islands, Ecuador. Loud "booms" (sounds like underground detonations, of varying intensities and seemingly different source directions), first reported by scientists in mid-March, were documented during fieldwork 20-27 March. The loudest, at around 1800 on 21 March, was almost immediately followed by a strongly felt shock (estimated to have 2-3 cm of vertical displacement at one location). Less intense "booms," occasionally followed by felt shocks, were heard at a rate of 2-13/day; variations may reflect location and activity of the observers. One notable "boom" and shock was followed by ground shaking that lasted more than a minute. While inside the caldera, observers reported a fairly constant "very low, barely audible, throbbing rumble" which they compared to the engines of a large ship. No substantial changes were noted at the fumarole area (in the SW portion of the caldera) since the previous visit in 1986. However, vegetation had receded possibly as much as 20 m from around most fumarole areas. Numerous fresh, hairline fissures, two to several dozen meters long, were visible along the lower border of the fumarole field, coinciding with devegetation. Steam emission from a large vent on the SE caldera wall, a geyser until drying up in 1970, was substantially weaker than in 1986 and the sound had changed from a jet roar to "more of an underground rumble". The first earthquake (mb 4.9) to be located in Galápagos since [5 July 1990] occurred at  on 3 March. Its hypocenter was  km [NW] of Alcedo, but accurate locations are difficult in that region and the threshold for locatable earthquakes normally exceeds M 4. Information Contacts: T. De Roy and M. Jones, Isla Santa Cruz; NEIC. Late-April fieldwork revealed continued but diminished sonic activity, no evidence of an eruption, and only minor changes to the volcano's hydrothermal system. Biologist Milton Friere, working on the island since February, reported that he felt a strong shock, apparently on 9 March at about 1900. Hunters on Santiago Island, 35 km NE of Alcedo, also felt a large earthquake around that time but there is uncertainty about the date and the WWSSN recorded only the 3 March event (16:3). Immediately after the felt earthquake, explosion sounds began to be heard daily at Friere's camp on the caldera's N rim. The initial sounds were the most intense and frequent, then they declined gradually, and by late April were heard only once every few days from the N rim camp. Fewer than 5 earthquakes were felt at the camp until 5 April. Others were documented on 5 April at 1740, 7 April at 1700, and 17 April at 1725. Events of similar intensity may have gone unnoticed during active fieldwork. While camped on the caldera's S rim during a 23-28 April field survey, Dennis Geist heard eight explosion sounds in 3 days, compared to 2-13 heard daily by Tui DeRoy and Mark Jones in late March (16:3). All were heard in camp, with none noticed during fieldwork. The sounds, consisting of deep rumbling lasting about a second, were likened to thunder generated ~ 10 km away. Although the sounds were clearly directional, each seemed to come from a different direction. None were accompanied by discernible changes in fumarole output, but two were followed 10-15 seconds later by a felt earthquake. The stronger earthquake lasted 5-10 seconds, whereas the weaker one continued for more than 30 seconds after a strong initial jolt. The seismicity and sonic activity were preceded by the first heavy rains in the Galápagos for several years. Between 26 February and 4 March, 5-10 cm of rain fell daily on Alcedo. Heavy rains also fell on 6, 8, 10, 19, and 30 March, and 10 and 15 April. Geist noted only subtle changes to the hydrothermal system. Before the 1991 activity, hundreds of fumaroles were distributed around both the southern ring faults and a vent that erupted voluminous rhyolitic pumice and obsidian flows about 90,000 years ago. Fewer than 10 small new fumaroles (identified by remains of recently killed plants) were observed, and no significant increase in total gas output was evident. A large fumarole (called "the Geyser" because it formerly ejected water) may have been somewhat more vigorous than during Geist's previous visits in 1989 and 1983. The vapor plume from this fumarole varied dramatically over periods of hours, and at times there was no visible cloud. No recently formed fissures or fault scarps were observed. Information Contacts: D. Geist, Univ of Idaho. Alcedo is one of the lowest and smallest of six shield volcanoes on Isabela Island. Much of the flanks and summit caldera are vegetated, but young lava flows are prominent on the N flank near the saddle with Darwin volcano. It is the only Galapagos volcano known to have erupted rhyolite as well as basalt, producing about 1 km3 of late-Pleistocene rhyolitic tephra and lava flows from several vents late in its history. Recent faulting has produced a moat around part of the 7-8 km caldera floor, which is elongated N-S and appears to be migrating to the south. 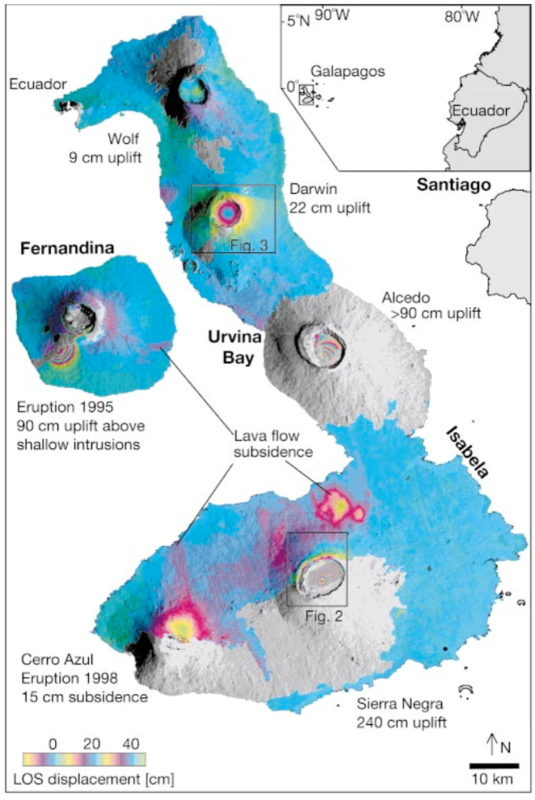 Fewer circumferential fissures occur on Alcedo than on other western Galápagos volcanoes. An eruption attributed to Alcedo in 1954 (Richards, 1957) is more likely to have been from neighboring Sierra Negra (Simkin 1980, pers. comm.). Photo-geologic mapping by K.A. Howard (pers. comm.) revealed only one flow on 30 October 1960 photographs that does not appear on 30 May 1946 photos. That is near Cartago Bay, low on the SE flank, rather than the 610-m, NE-flank elevation listed for the 1954 eruption. An active hydrothermal system is located within the caldera. Geist D, Howard K A, Jellinek A M, Rayder S, 1994. 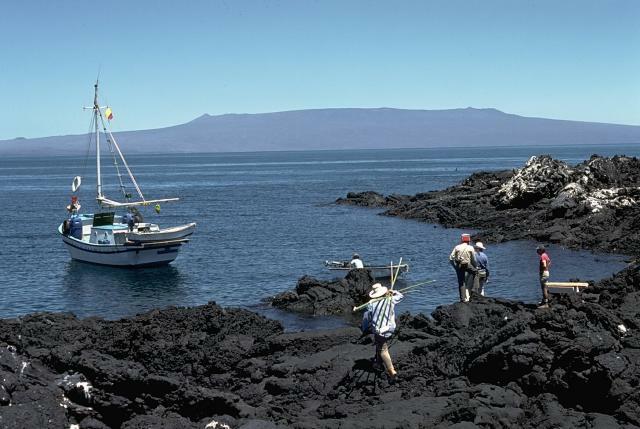 The volcanic history of Volcan Alcedo, Galapagos Archipelago: a case study of rhyolitic oceanic volcanism. Bull Volcanol, 56: 243-260. Remarks: Persistent scatterer InSAR analysis shows subsidence over Alcedo from 1997 to 2001. Mean LOS velocities on Alcedo between October 1997 and November 2000 from descending orbit data. The velocities are relative to the mean velocity of PS pixels on the coasts. From: Hooper et al. 2007. Reference List: Hooper et al. 2007. There is no Emissions History data available for Alcedo. 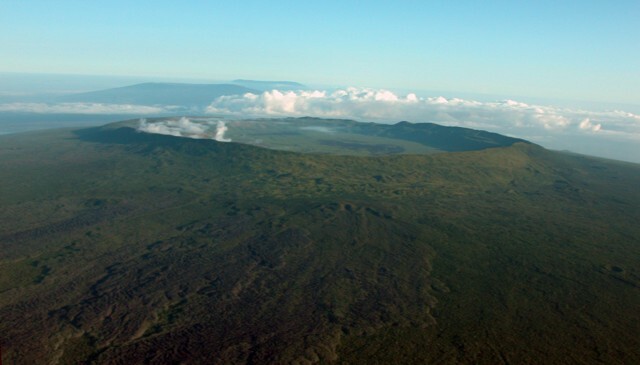 The large 7-8 km wide summit caldera of Alcedo volcano is seen in this aerial view from the south. 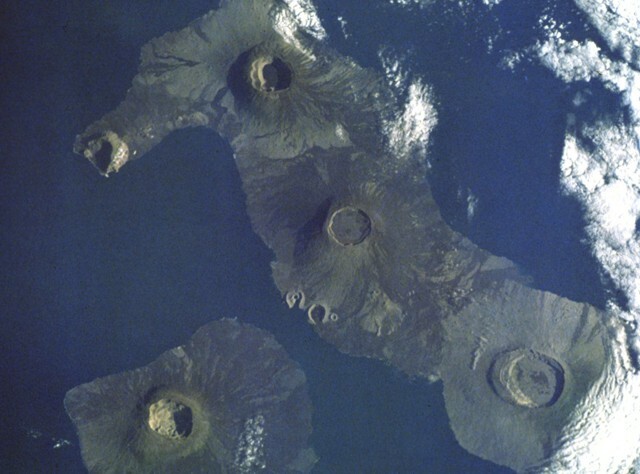 Alcedo is one of the lowest and smallest of six shield volcanoes on Isabela Island; Darwin and Wolf volcanoes can be seen in the background. Much of the flanks and summit caldera are vegetated, but young lava flows are prominent on the northern flank near the saddle with Darwin volcano, and an active hydrothermal system lies within the caldera. The Global Volcanism Program has no maps available for Alcedo. Large Eruptions of Alcedo Information about large Quaternary eruptions (VEI >= 4) is cataloged in the Large Magnitude Explosive Volcanic Eruptions (LaMEVE) database of the Volcano Global Risk Identification and Analysis Project (VOGRIPA).